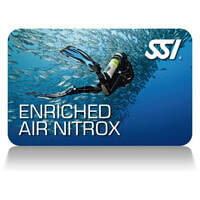 Once know as "VooDoo Gas" by some, Enriched Air Nitrox (EANx) has now become an accepted norm in the diving world and is often referred to as SafeAir. Diving with EANx can increase your no stop limits and reduce the required length of your surface intervals when compared to air. During this course we will teach you how to safely plan and dive with enriched air mixtures of up to 40% oxygen and you will earn your Enriched Air Nitrox Diver Certification upon completion.